Copyright �2005 PopEntertainment.com. All rights reserved. Posted: April 4, 2005. With Sideways, Alexander Payne really proves he�s a true contender, not just the creator of smart, snarky idiosyncratic comedies but solid filmmaker who tackled humanity with aplomb. In this humorous on-the-road buddy flick, leads Paul Giamatti (failed writer Miles Raymond) and Thomas Haden Church (former hot actor Jack) grapple with Jack�s final week of freedom before marriage. 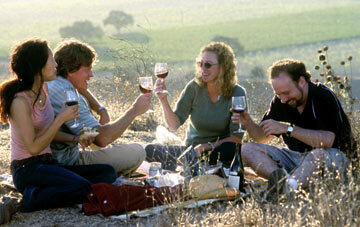 In doing so, they review their lives through their bumpy ride throughout the California�s wine country. Though Payne�s previous films Citizen Ruth, Election and About Schmidt garnered acclaim, Sideways garnered him the Oscar Nom for Best Picture and Best Director because it displays a real wisdom that needs to be experienced. When did you decide this was the project to do? It was easy. I read it and thought it would be great. I sent it to Jim; he thought it was going to be great. And I even thought that I might be easier trying to adapt it on my own. But that�s not fun so, Jim and I ended up doing it. So you have someone to bounce off ideas. Writing is hideous, solo. There�s something about screenwriting which lends itself to collaboration. You don�t see it with novelists; you don�t see it with playwrights. Yeah but it�s something about screenplays that leads itself to collaboration. For general ideas�well being in the shower, or driving, or hopefully sitting in front of a desk on the computer [laughs slightly]. That�s really where you force inspiration to come; sitting down and facing that blank page. And also, I work with a co-writer. We always try to make each other laugh, and it comes from there. Then while directing, I take a nap every day and I get ideas for the afternoon during my naps. 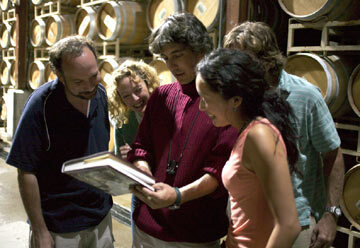 You really seem inspired with Sideways�this is your most rigorous film. I hope to God�if there is one�that I�m learning more about how to make a film. I mean, what the hell is a film? I don�t really know, and I consider myself a film student who is just getting paid professionally. I feel like I�m at a professional apprenticeship program -- How to make a film. So I am so happy that this seems to be my best made film so far. I have a sure grasp on the craft but I am always aspiring to know better film craft. I mean, the more I know I see, the less I know about film craft. It�s just that I know myself better as a person. At 43, for Christ-sake, I hope I learned something about experience. That�s the most important thing�that it gets channeled. How do you decide what goes in the screenplay from the book and what you change�what�s the process? That�s a really hard question to answer, �how do we do it?� Because we just do it. It�s very instinctive. You would do it differently. So it�s just what strikes Jim and me as being appropriate that we can encase, within a form�a two hour movie. So there were wonderful set pieces in the book, for example like Jack and Miles goes boar hunting. They met up, they were singing karaoke one night and they meet up at a bar with a guy and he talks about boars, because there are a lot of wild boars in the idea. And it would have been a really great sequence, it�s like when they play golf or when they get that wallet back, but that would�ve been like a twenty page commitment. You felt so passionate about this film that you wanted so much control over it�is that what made you guys do this as an independent production? I won�t claim that I�m very talented at any single aspect of filmmaking, but I am talented at casting. You took a risk with some of these actors; you thought that Virginia [Madsen] would always be the person to play that character. I�m always very proud of my secondary characters. Like in Sideways, I like the guy who plays the bartender at the Hitching Post, Gary [Patrick Gallagher]. And Miles� mother, Mary Louise Burke, she�s a stage actress. I cast off-the-street nonprofessionals, and non-actors, even. Since you�re married to Sandra Oh�was it difficult directing her, or easier? Easy. No, I wouldn�t say �easier�, but I think she�s just a generally an easy �directable� actress in general, a real pro. Did you hold back, not be as tough with someone you�re married to? How were the wine drinking scenes with the actors? With the fake wine? Yeah, I�m sure the actors have maybe talked about it. No, I didn�t force it. If the actors had wanted to drink the real wine, they could have it. I didn�t care. As long as they can still mumble the dialogue. Did you enhance your own wine collection? A little bit, yeah. At least I enhanced my knowledge about wine. Have there ever been times where you think that you�d spend more time writing, or editing rather than directing. No, Jim and I have done three film script-doctoring jobs. But only because they�re two to four week jobs. We�re often approached to write scripts for other directors, like from scratch. And we�re not interested. You always wanted to direct? I�ve been trained as a director. Then what interested you in producing The Assassination of Richard Nixon? It was co-written by two guys, my closest friends from film school and I liked the script very much. Anything I could do to get that made and lend any bit of a momentum to it, I would do. So I�m really not interested in being a film producer at all. I get approached a lot now to produce or executive produce films, but I�m very selective about it. So I usually just do it for friends I believe in. And what attracted you to it? It's Taxi Driver-ish in a way, and also there�s a political side to it which I found interesting. It has dialogue when Nixon tried to run in �68 in promise on ending the war in Vietnam. He escalated the war. Later he ran in �72 on the very same promise of ending the war, and was reelected. In our country, people are sheep and are easily susceptible to being sold ideas. That�s an important message to get out there. It may even be relevant to our times. In terms of control, how different was doing Sideways compared to About Schmidt and Election? It gets easier every time, because I�m learning more and my collaborators are learning more, and not just because we�re learning more: but our collaboration is sweeter and there is more shorthand. And not having to be under the studio�s scrutiny? My stuff is not typically commercial and possessed of easily marketable elements in today�s cinema. Here�s our two-minute warning. But as more people in Hollywood get more of what I do and what the tone of my films are� and how to read one of my screenplays�then it becomes, I won�t say easier, but less hard to get one of my things made. Also, when I�m arguing about something, I�m believed more often now that it could work. Also Fox Searchlight is such a fantastic studio. They�re all about doing independent, personal, author-istic, director-driven, or whatever term you want to use. That�s the kind of films they�re making. And they�re doing so very successfully, by trusting the directors and trust is the best weapon you can wield. Now you�ve seen the completed movie with an audience. Is the reaction what you expected, or better? Better. Oh yeah. And who else? I just hope my friends will like it. We sort of like it, it�s okay. But you never how it�s going to get. Do you feel that you just never know with each film? The best definition of film directing is groping in the dark. You hope that it�s all instinctive, and you hope other people will like it, but who the hell knows? So that it�s getting such early general notices, I mean at the receptions, people laugh a lot, I mean I think they�re happy to laugh a lot, and people seem to be responding to the fact that it�s just sort of a human movie. And that�s kind of rare today in American movies. It seems to be hitting people at the right time, and I have no control over that. #1 � 2004 Courtesy of Fox Searchlight Pictures. All rights reserved. #2 � 2004 Courtesy of Fox Searchlight Pictures. All rights reserved. #3 � 2004 Courtesy of Fox Searchlight Pictures. All rights reserved. #4 � 2004 Courtesy of Fox Searchlight Pictures. All rights reserved.